A firearm is an item for which a bill of sale plays an important role. It is not just a simple receipt for an item sold; it is also a document that gets used a lot more in legal cases. 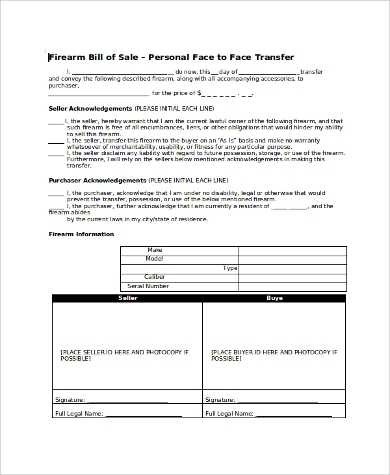 The following firearms Bill of Sale Samples have all the mandatory fields and necessary declarations that make the buyer aware of its proper usage and the seller to confess that there are no past disputes. It is also a document to prove the transfer of ownership. This is a bill of sale for a private firearm. It contains fields to fill up the seller’s details, the buyer’s details and details about the firearm, action type, price and mode of transaction and other necessary description and usage that the buyer should know. 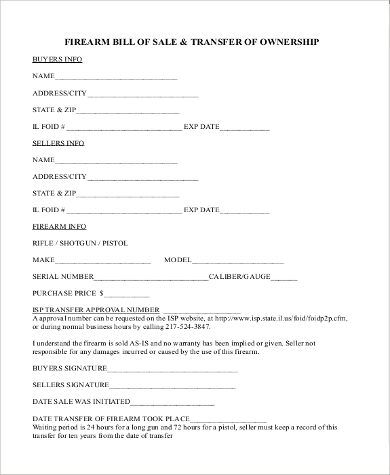 This is a perfect bill of sale for any firearm, and it is also a form of transfer of ownership from the seller to the buyer. It is divided into several sections for proving buying details, seller details, firearm details and transfer of ownership declaration. It is a bill of sale or transfer of firearms sample. It has all the necessary fields like seller’s and purchaser’s details, details of the firearms and their types, transfer of ownership and declaration of its usage and no past disputes. Firearms are a sensitive and dangerous item. Some people buy it for private use such as self-protection while others use it for specific legal purposes. The Bill of Sale Samples for gun cater to different criteria such as apart from necessary details of the buyer, seller and the firearm sold, there are provisions to certify the transfer of ownership. There are several declarations like no past disputes, proper usage of the gun and violation of laws under certain conditions. They are legal documents, and the buyer needs to produce it whenever there is a legal procedure or inspection. This is a bill of sale for selling multiple firearms at once. 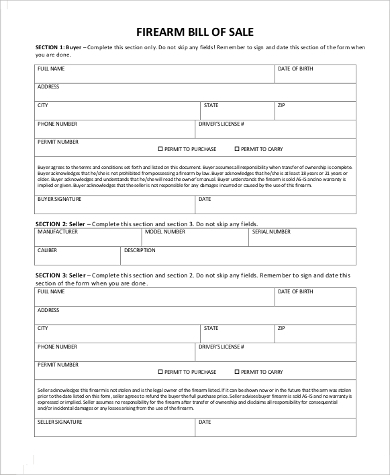 It comes in a tabular format to write the details of the firearms sold, and it must be signed in front of the notary officer. It contains all other necessary fields. 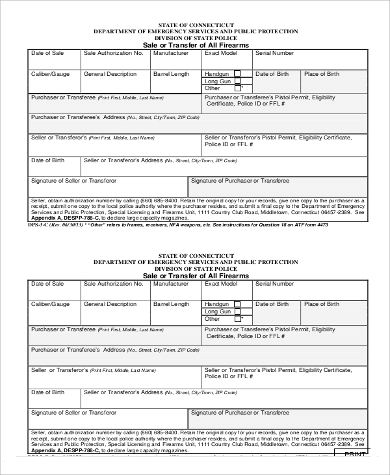 This is a firearm bill of sale where it is acknowledged that the buyer knows the proper application of the firearm sold and that there are no past disputes for the firearm. Apart from mandatory fields, there are several terms and conditions of usage and other necessities. 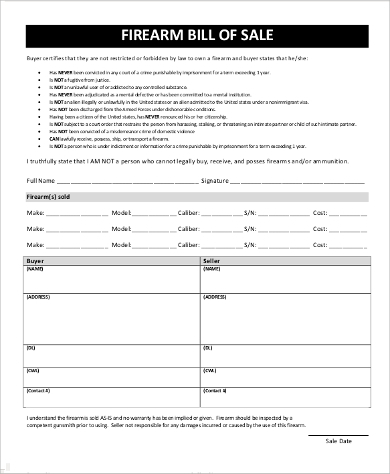 The above-listed Sample Firearm Bill of Sale Templates are complete, perfect and professional. 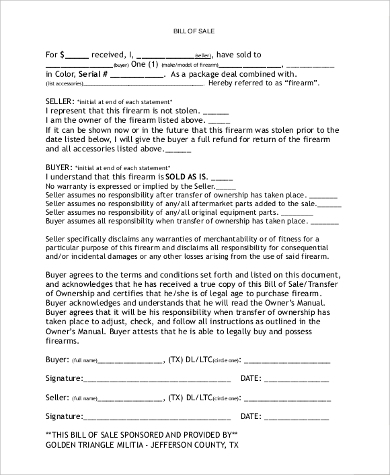 There are all the necessary fields such as buyer and seller details, details of the firearms sold and declarations that the buyer must agree to and never violate while using the firearm. 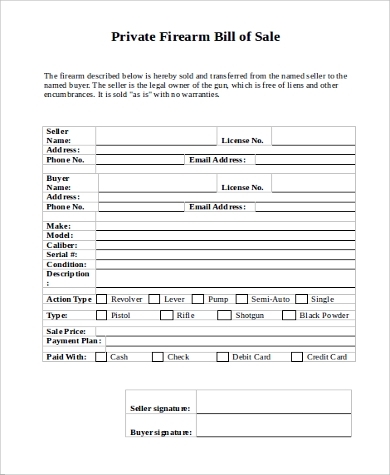 There are different types of bill of sales such as the ones that come with notary stamp, with the transfer of ownership form and selling guns in a lot.